Custom Design - The Perfect Fit! Custom Quotes - Free Design! Work With a Designer - Free! We loved our wall decal so much that we are reordering it. I tore the original trying to take it down before repainting, but it really defines our family space. Mother's Day BOGO Gift Certificates! A popular quote from Christopher Robin and Winnie the Pooh! Not seeing exactly what you're looking for? Submit a FREE Custom Quote Request. Need a custom design or printed logo? We've got competitive prices, fast design service, and have served thousands of happy custom design customers. 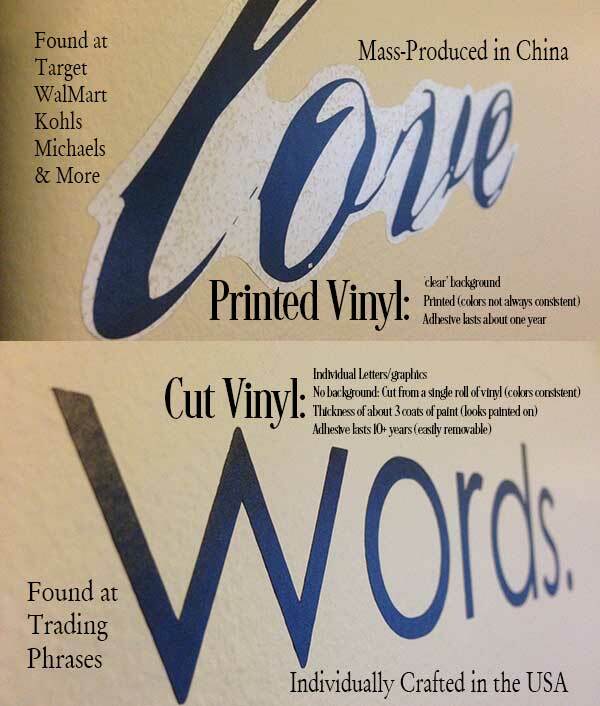 Vinyl wall decals from Trading Phrases are an easy, no mess, and affordable way to add personality to your home or business. We use the industry standard high-quality vinyl in a beautiful matte finish which results in a hand-painted look. With over 5,000 stock designs you’re sure to find the right design. If not, we have designers ready to work with you to create your personal masterpiece. Our vinyl decals are easy to apply to any clean smooth surface and can be used on walls, wood, glass, tile, furniture, floors, windows – the possibilities are endless. Your graphic will last indefinitely if you wish, or you can simply remove it when you are ready for a change. We include full instructions, an installation tool, plus a practice piece with each order. We offer free color samples of all of our 63+ colors. For more specific information, please visit our FAQ page. Please see our installation videos for more installation tips and tricks. View our Cut Vinyl Colors! 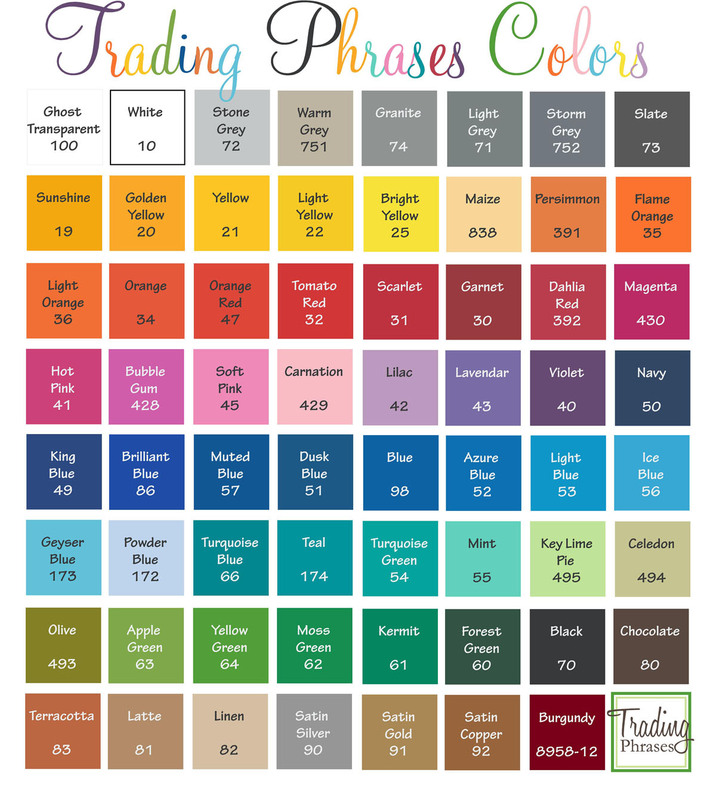 : Choose from 63 beautiful colors for our cut decals. Need a specific color or have a multi color design or photo? We also do printed decals and other products. Just ask! How We Measure: Most of our decals come in a variety of sizes and are generally measured in inches as length/width x height/tall. If you need a specific size (or change to a design), please contact us and we will try to accommodate you. Guarantee: We offer a 100% satisfaction guarantee. If you are not 100% satisfied with your decal purchase for any reason, you can return any unused vinyl graphics to us, within 14 days of purchase, for a full refund (minus shipping). Why choose cut decals over printed ones? See the difference between cut and printed decals and you won't be asking any longer. Why Trading Phrases? Trading Phrases has sold tens of thousands of decals across the US and in over 66 countries world-wide. Our decals are not available in any store as each design is custom cut for you when you order it. We offer the most designs, the most color choices, and the most customization options bar none. We have customer service personnel available M-F 10-5 EST to answer your questions, and designers at the ready to handle your quote requests. Our customers love our freebies that we throw in each package, and our customer satisfaction is a priority for us. All designs ship from our production facility in Columbus, Ohio and are made by a staff of fun loving design enthusiasts. What do your walls say about you? This customer purchased the item at our site. I received my order on Tuesday and I was so pleasantly surprised to see a set of paw prints and some shamrocks included in the package. Not sure why they were there but thank you! The product looks GREAT! The best part is I'm Irish and a pet lover so the extra items were perfect lol. Thanks again. I look forward to putting up the item I bought this weekend and will definitely be ordering again for other rooms in my house. We want you to have the chance of trying our tasty teas. Shipping is free, so sip away! Sample = approximately 2 grams of loose leaf tea. Makes 1 cup of tea. Cost is $0.99 each or free (up to 3) with our coupon code! Shipping to the US is free! Tea Sampler = Find your new favorite flavor from one of our collections. Each sample contains 2 grams of loose leaf tea and makes a single cup of tea. 3 samples for $0.99. *Rush Processing is simply moving your order to the front of the queue for processing and gets out of our door the next business day. If you absolutely positively need it sooner, please choose Express shipping. There are a few general rules of thumb to steeping tea based on the type you're infusing. Portions are generally 1 1/2 tsp for each cup of tea to 8 ozs of water. White Teas: Heat water until just before boiling (or remove from a boil for 2-3 minutes and let cool slightly to about 180°F. Steep 30 seconds to 2 minutes. Green Teas: Heat water until just before boiling (or remove from a boil for 2-3 minutes and let cool slightly to about 180°F. Steep 1-3 minutes. Green teas should taste sweet. If the tea is bitter either the water was too hot or it steeped for too long. Pu-erh (fermented/aged tea): Heat water until boiling (212°F). Steep 5-10 minutes. Oolong: Heat water until boiling (212°F). Steep 3-5 minutes. Traditionally Oolongs leaves are used 3 times. Black: Heat water until boiling (212°F). Steep 3-5 minutes. Tisane (Floral/Herbal blends that don't actually contain tea): Heat water until boiling (212°F). Steep 3-5 minutes. Hot Method: Use 1/2 the recommended amount of water for the amount of tea. Steep for the recommended time (see above). Remove tea leaves. Add the remaining amount of cold water. Sweeten as necessary and chill. Cold Method (Black/Herbal Tea): Use the full recommended amount of tea. Add cold water. Steep 1-3 hours. Remove tea leaves. Sweeten as necessary and keep refrigerated. Consume within 3 days. Cold Method (Green & White Tea): Use the full recommended amount of tea. Add cold water. Steep 30-60 minutes. Remove tea leaves. Sweeten as necessary and keep refrigerated. Consume within 3 days. Tea Latte: Make a tea concentrate by brewing tea in 1/2 the recommended amount of water. Add steamed milk and foam. Naturally Decaffeinate Tea: Steep the tea using the recommendations for 30-45 seconds and pour off the liquid. Add the hot water using the recommendations and steep as normal. 80-90% of the caffeine is released into the brief infusion, and subsequent infusions will have minimal amounts of caffeine. Allergen notice: Some of our teas contain dairy, barley, and tree nuts (no peanuts). We make every effort to thoroughly clean the equipment between packaging runs, but we cannot guarantee that no cross contamination exists. Products with known allergens as ingredients are listed on labels and on the website ingredient lists. 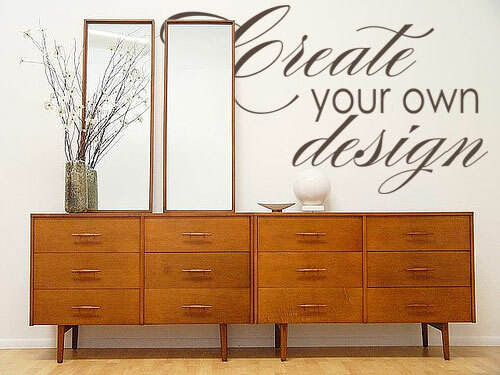 Skip the design step and create your own custom and unique wall decal right here. Find yourfavorite font, then choose your size and color. Enter the text and we'll get it cut and on it's way in a jiffy. Decals will come as you enter the text, including spelling, grammar, punctuation, etc. You have the option of left, right or center justifying the text if using multiple lines. Of course when you receive the decal, you can always cut the lines apart and put them on your wall as you see fit. If there are any special instructions, please include a note to let us know what you need. If we have any questions, we'll contact you before we ship it. Cut decals are custom made for each customer's order. You choose the size, color, and style you'd like, and the design is then computer cut from a single roll of vinyl. Our premium vinyl means that if you need to match the color with a coordinating decal in the future, you're guaranteed to have an exact color match. There is also no outline or contour cut around the decal. No background means that your design or lettering looks hand painted on the wall, with the color going all the way through the vinyl. This color will not fade over time, and it is extremely durable. And don't get us started about the variations in quality of the vinyl that comes from China. Suffice it to say that your mileage may vary on those printed decals you found in the clearance bin. The photo below shows a typical printed decal with a clear background contrasted with a cut decal on the same wall. The thickness is the same (about the width of 3 coats of paint), but the printed decal shows the sheen of the background vinyl even where there is space between the letters. If you have a multi color design or a photo or colored art, then we will happily print your decal. For most home applications, we recommend cut decals over printed ones. 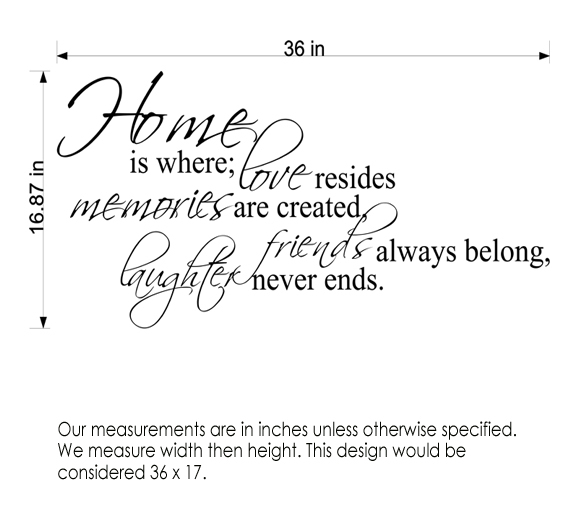 Our Measurements: Please note, most of our decals come in a variety of sizes and are generally measured in inches as length/width x height/tall. If you need a specific size (or change to a design), please contact us and we will do our best to accommodate you. Our largest cutting machines can handle widths of up to 48" wide (and 50 yards long), giving us the ability to handle giant commercial and home decor designs. Have questions about measurements? Shoot us an email and we'll get back to you asap! By clicking "Subscribe" you are signing up to receive periodic emails. All of our colors come in a beautiful matte finish which looks stunning on a wall. The metallics have a slight sheen to them. The most popular colors are black, chocolate, white, silver, linen, and latte. If you'd like to request a free color sample, click here. Create the decal design you want with the help of our professional designers for FREE!. Decals can be made in just about any size, font, layout, and color you need. We've worked with thousands of happy customers to create the design they need. It is easy to get started! 1. Once we receive your request, we will get started and email back with a mock-up of your design, from there you tell us what changes you'd like to see to how it looks. In this step we manipulate the design to make it exactly how you would like it- change the formatting, add embellishments or colors, basically any changes you have. 3. After you are 100% happy with your design and have no changes we can move on to the sizing. .
4.Only after sizing can we give you a price. We price our designs based on the amount of vinyl that we use, and that will change with formatting and sizing changes. 5. Once the process is complete you will be able to find your design on our site in our new items category or by searching with keywords in our search bar. We will send you a link to your design when it is posted. Try working with a few fonts before starting the process by clicking HERE. View our colors, or request a free color sample by clicking HERE.